Marriage applications date as far back as 1820, but there are no divorce certificates from any county before October 1907, and the registering of Wisconsin marriage records was incomplete prior to October 1907. The Wisconsin Vital Records office will issue certified copies to family only and informational (identical but uncertified) copies to anyone. Requests must be made in person, by fax, or by mail, but not by email, telephone, or online; the price includes a multi-year search. Onsite searching of indexes and original records in the state vital records office requires an appointment, and there is an online list by county for the earliest Wisconsin marriage record date. The Wisconsin Historical Society has an online search for marriage records before October 1907. 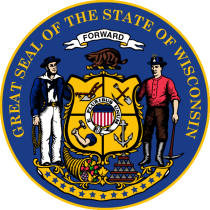 Wisconsin divorce records can also be found in county civil court records. Early divorce records for 1836-1848, granted by the territorial legislature, have been published in genealogical newsletters. Note: An uncertified copy of a marriage certificate is available to anyone who applies. An uncertified copy will contain the same information as a certified copy but will not be acceptable for legal purposes, such as obtaining identification. Record Access Requirements: Must have a signed release from the named parties for certified copies. Requests for uncertified copies do not require a release. Note: An uncertified copy of a birth certificate is available to anyone who applies. An uncertified copy will contain the same information as a certified copy but will not be acceptable for legal purposes, such as obtaining identification. Record Access Requirements: Must have a signed release from the persons of record for a certified copy. Requests for uncertified copies do not require a release. Record Access Requirements: Criminal record information is open to the public per statute 3-21-91. Certain statutorily-required searches require fingerprints. Search Note: All requests must be in writing. You must have an account with CIB in order to submit fingerprint cards. The account application can be downloaded from the web, as are request forms. Search Note: Location, conviction and sentencing information, and release dates are provided. Send questions or request to docweb@wi.gov.